Traveling with kids can be tricky. The dreaded questions would be, "Are we there yet?" or in Aza's case (yes, he eats a lot, bless him, like his ma) "What to eat?" or in Chika's case, "What else to do? I'm bored." 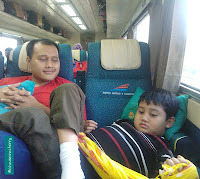 My partner and I took our children (Aza, aged 8 and Chika, aged 5) to Jogjakarta from Bandung, by train, on July 12. The trip took almost eight hours. We made some preparations. Snacks? Check! Lunchboxes? Check! Magazines? Check! Blankets? Check! Odds and ends. Extra clothes and all. We figured that the kids would just doze off or something. Not. For the first two or three hours, they were too enraptured watching the scenery. And they kept asking questions. That was to be expected, of course. Aza was more excited and he kept pointing at something. "Look! A mountain! A hill! Paddy fields! Scarecrows! Children playing soccer!" 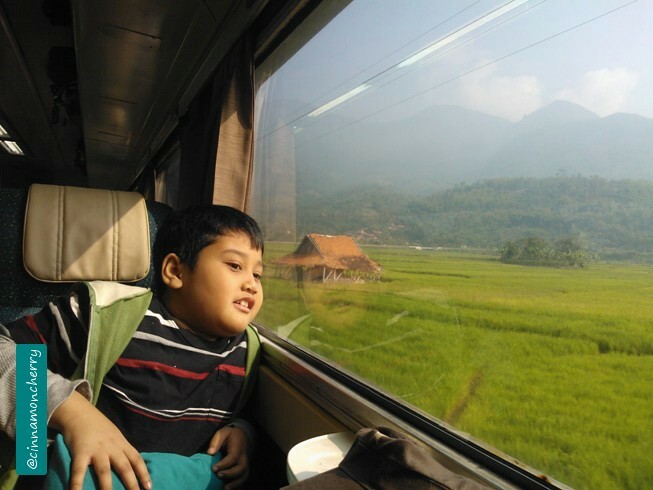 And sometimes they wondered, how many kilometers from Bandung to Jogja? Why was the train so slow? Why can't they make shinkansen like in Japan, in Indonesia? How do they cook in the train? How about the toilet system? If I jump from the train, will I be okay? After a while Chika slept and Aza got bored. Ha ha! The most important thing if you want to bring your kids along with you is: patience. Perseverance, too. Keep amusing them by stories about the surroundings, about places they are about to see. And of course, if all else fails, bring something to delight your kids and keep them occupied. Or in this case, my cell phone.